As ERC’s Manager, Content Marketing, Liz plans our editorial calendar and executes content strategies that drive engagement, leads, sales, and customer retention. She produces high-quality, engaging copy across all print and digital marketing channels and deploys SEO tactics to create and maintain top-ranking web pages. Liz is charged with creating and monitoring ERC's weekly email campaigns and developing content for all of ERC's social media platforms. Liz previously worked for seven years in the Advancement Office at Notre Dame Schools. In her role, Liz directed their annual giving campaigns, executed events, and served as the liaison to the NDCL Alumni Association. In addition, she wrote content for their quarterly publication, initiated paid social campaigns, and managed their Facebook and Instagram accounts. Liz has written articles for Geauga Business Magazine, The Erie Times-News, The News-Herald, and The North East News-Journal. 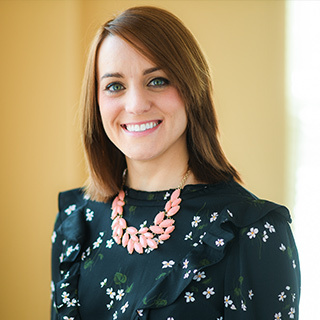 She holds a master’s degree in organizational leadership with a concentration in human resources and a bachelor’s degree in communication and educational studies, both from Mercyhurst University. While at Mercyhurst, Liz was a four-year member of the women’s softball team and served as a staff writer on the school’s newspaper. Outside of work, Liz is an active volunteer with Leadership Geauga and St. Francis of Assisi Parish in Gates Mills.